Identification of company’s strong and weak points. Remote video monitoring is a rapidly developing security method for monitoring, recording and identifying processes and events in the territory of guarded Object and the Object itself. Clients are concerned about watching and recording events thus they increasingly address us. Video monitoring systems are installed in objects demanding video information which is necessary to fixate events on objects guarded. With an increasing number of thefts from company’s premises majority of owners prefer systems of video monitoring and recording. Although video monitoring cameras do not actually catch offender yet the system is an excellent form of prevention against burglars. 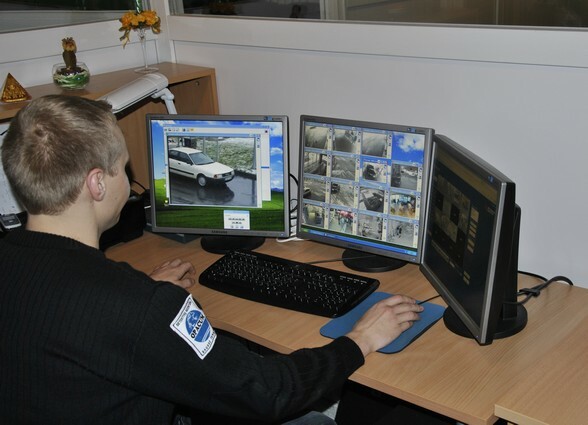 Usually clients choose video monitoring system and remote video monitoring service as a thorough system of security. High quality video monitoring systems have significant advantage of identifying trespassers or investigating and proving thefts committed. Apace progressing computer technologies allow to efficiently control and employ digital video signal. Video archiving gets done without previously regular yet inconvenient today video tape cassettes. Digitally recorded images are certainly of highest quality and longest service life. Durability of records - recording to hard disk prolongs records service life since image quality does not depend on times events were recorded or viewed. Reliability - digital video recorder contains few moving parts therefore it’s service life is considerably longer if compared to analogous video tape recorder. Easy search of events - since the record is digital the search of desirable event by time or alarm activation criteria is simplified. Video monitoring system and remote video monitoring increasingly become needful for companies suffering because of bad reputed employees or thieves. upon request we connect object guarded to monitoring center run by qualified specialists. Upon client’s request, considering the specifics of company’s activity, number of employees, we prepare all mandatory occupational safety and health documents. The documents are being prepared following most recent legislation of Republic of Lithuania and regulations of European Union. We also prepare fire safety instructions with accordance to particularity of the company, directions of fire safety controlling officials and recent legal acts of Republic of Lithuania. Apart from fraudulent and insolvent business partners, a company is also threatened by internal thefts and frauds by employees. 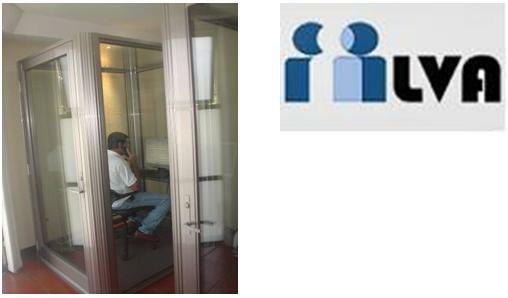 Our specialists with the help of special psychological methods and computer technologies will assess Your current employees and new candidates for personal and professional qualities necessary for certain job positions. This method is based on a layered voice analysis (LVA), developed in Israel and widely used in the European Union, USA, Canada and other countries for security purposes. Voice analysis is unique in that everything it requires is a human voice. Human speech mechanism is a complex mind-controlled process. The technology uses complex mathematical algorithms, processes what has been said and produces a so called emotional footprint of the brain: what emotional and psychological processes took place during a speaking which make it possible to decide whether a person was open or told lies. You can make measured decisions only if you have all verified information. Assessment of risk factors through the LVA technology allows disclosing not only past offences or crimes but planned intentions to pursue an unlawful act in the future (based to analysed risk factors) as well. You attended an important interview or conducted an internal research but you don’t know whether you can trust the answers? Our specialists can analyse a conversation record and determine whether a speaker lied and which aspects of conversation should be investigated further. Any important questions, any speech, free-form ordinary conversation or interview can be analysed using the same risk factors as in the analysis tool LVA-i. A tool for conversation analysis is LVA 6.50, which analyses how something was said instead of what was said. It is possible to determine a speaker’s emotional condition during speaking and separate out risk factors in important questions and false answers. Polygraph technique reveals only past facts while LVA technology explores future intentions too.